He wouldn’t be “Mr. 59” for nearly two years, but in August of 1975 Al Geiberger was already a proven star in the midst of his best season. That made him a formidable foe at the second edition of THE PLAYERS Championship at Colonial Country Club in Fort Worth, Texas. What he morphed into that week was an unbeatable foe. Like everyone else in the field, Geiberger was roasting in the Texas summer heat. But the pleasant man from Southern California employed a superb strategy: As temperatures kept nudging over 100 degrees, he kept scoring below 70. On the strength of 66-68-67, Geiberger pushed to a Colonial record 201 for 54 holes and he maintained his three-stroke lead over Dave Stockton when each man closed with 69. At 10-under 270, 7-under and 5-under, Geiberger, Stockton and Hubert Green, respectively, were the only players to break par. So demanding were the conditions that defending champion Jack Nicklaus could do no better than 7-over. The only man to break 70 each day, Geiberger won for the second time in 1975 and it was the seventh of his 11 career wins. It earned him $50,000, the biggest check of his career and went a long way toward his sixth-place finish on the money list ($175,693, about $120,000 behind the leader, Nicklaus). Quality stuff by any measure for Geiberger, who two years later would go to another Colonial CC, this one in Memphis, and shoot the first 59 in PGA TOUR history. His 54-hole total of 201 set a record at Colonial, and despite a matched 69 on Sunday by Stockton, Geiberger maintained a three-stroke lead total of 10-under par 270. 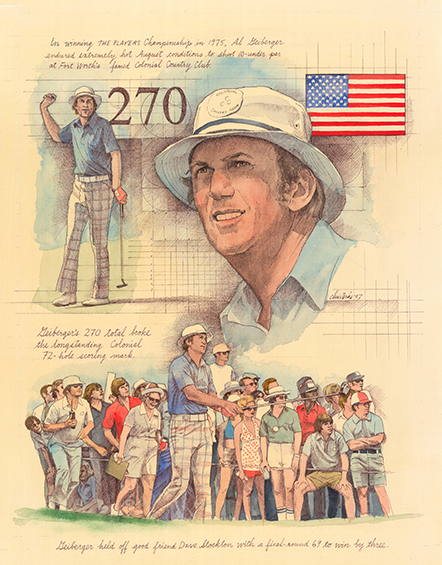 Relocated from Atlanta the previous year to Colonial Country Club in Fort Worth, Texas, 1975 will fondly be remembered as a shoot-out for three rounds amongst two close friends, Al Geiberger and Dave Stockton.